Is Nobu Berkeley the most uptight and pretentious restaurant in London? Well, judging from my experience, it most certainly deserves to be on the shortlist. (1) Handing my coat to the ice maiden at reception invoked nothing but a snooty glare. She said and did nothing other than stand there until the coat lady turned up to take it (I mean, how was I suppose to know that it was someone else’s job?). (2) It appears that if you sit in the bar area downstairs with a drink, and it runs past your reservation time, another ice maiden will not hesitate to come over and insist you go upstairs to your table. Apparently the restaurant only holds tables for 25 minutes and each sitting is two hours. I may not have been Cheryl Cole, but was it really necessary to exercise such Stalinist muscle when we were spending money at the bar and the restaurant was one-third empty throughout the evening? So upstairs there were three more beautiful ice maidens behind another reception counter who didn’t appear to be doing very much other than look pretentious and occasionally take people to their tables. To be fair, the waiter that served us was quite friendly, but then he probably wasn’t some struggling model type. The bar downstairs is the height of sophistication and elegance and justifies its tag as an A-list celebrity hangout joint. The décor in the dining room upstairs was far less striking but was far more stylish than Nobu London on Old Park Lane which I thought looked like it had been fitted out as an expensive canteen. Nobuyuki “Nobu” Matsuhisa spent three years in Lima and a short stint in Buenos Aires in his twenties, and it was there that he developed his fusion Japanese and South American style. 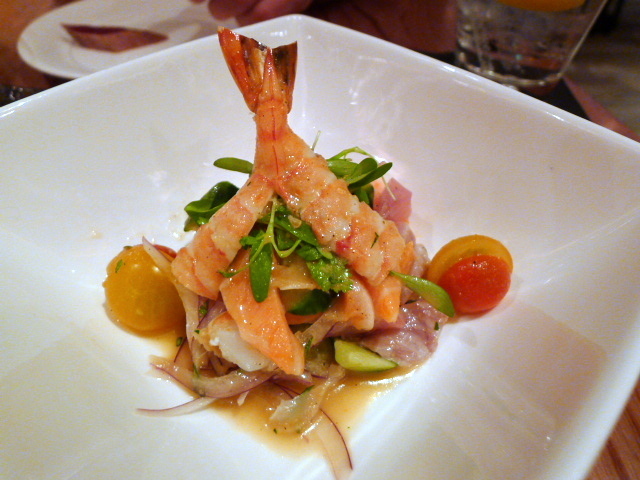 It was therefore unsurprising to see dishes such as seafood ceviche (£10) on the menu. Containing a mixture of lovely fresh prawn, salmon and turbot, there was also a touch of coriander which was beautifully fragrant. However there was too much citrus in the dish which slightly overpowered the delicate flavours of the seafood. 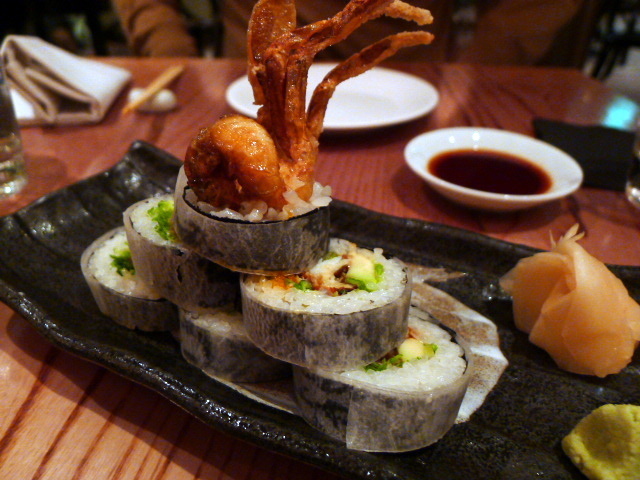 A soft shell crab roll (£10) was tasty, if you happened to get some decent amount of crab. The crab hadn’t been dispersed evenly throughout the roll, so in some pieces you got little more than rice. The preparation could have been better. 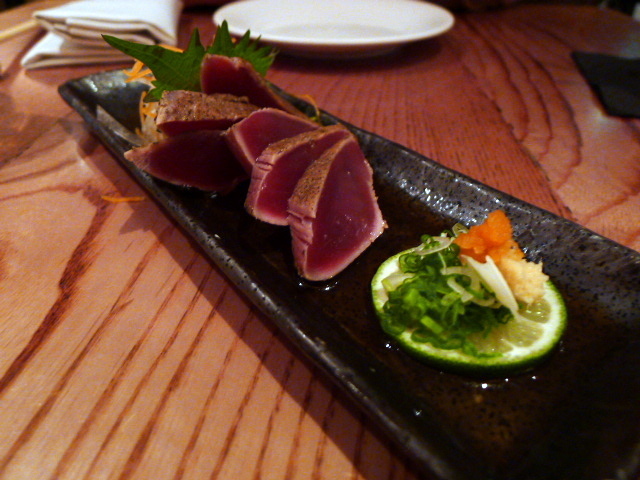 As you would expect with fish supplied by Atari-ya, the tuna in a tuna tataki with ponzu (£10) was lovely. Seared slightly, it came with a delicately tangy ponzu dressing. 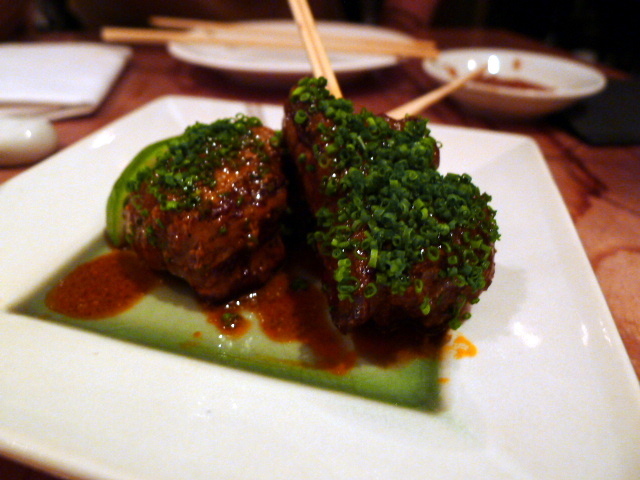 Another Peruvian-inspired dish, and this time it was an anticucho beef skewer (£13.25). Two skewers containing beautifully cooked pieces of medium rare meat was covered with an anticucho marinade made from a mixture of chillies, garlic, cumin, oregano, sake, lemon juice, soya sauce, shiso, etc. I found the marinade slightly busy. 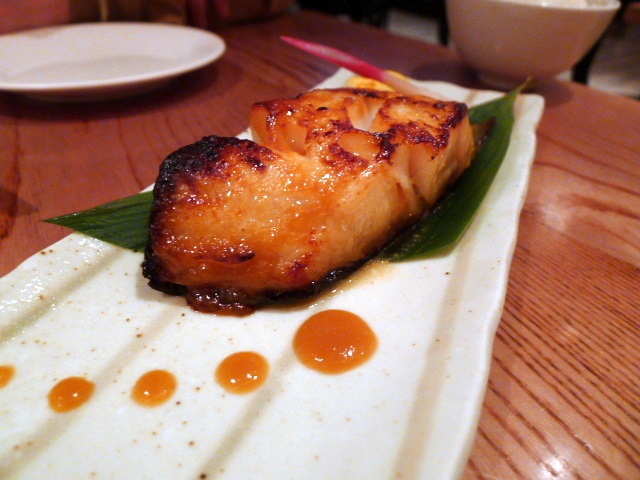 To Nobu’s signature dish – black cod with miso. This was a huge disappointment, not least because Nobu charged a shockingly extortionate price of £35.25, but also because there was not enough sauce on the fish. Granted, the cod was extremely tasty, and you could cut through it like butter, but the sauce is what completes this dish. For the princely sum of £35.25, I had expected perfection. A bowl of rice to accompany our fish was served lukewarm. I was expecting steaming hot rice from a one Michelin-starred restaurant. A dessert known as ‘Hazel 8’ (£10.50) with gianduja mousse and a passion fruit core was pleasant, but it needed more zing from the passion fruit to cut through the richness of the chocolate. It was served with some decent, albeit not amazing, roasted hazelnut ice cream and moromiso toffee. There was a time, when Nobu first opened in the States, that it was considered ground breaking. But this is true no more. Many other restaurants replicate similar dishes, sometimes better and often cheaper. Tsunami is a good example. Their black cod with miso is only £19.50 and from memory it tasted better. 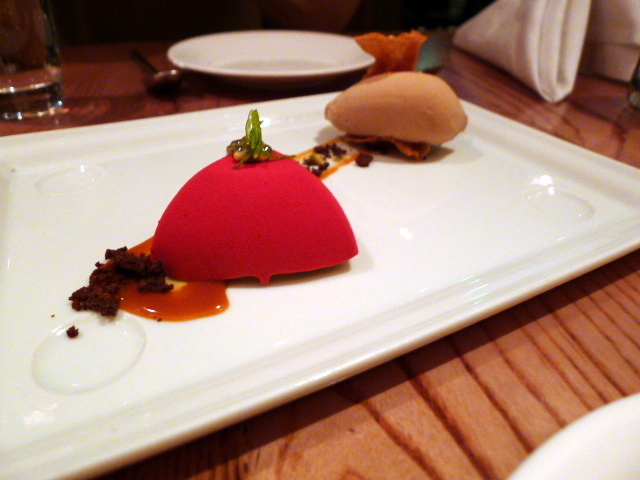 On the whole, the food at Nobu is very good, but the portions are dainty and pricey. And that black cod with miso, well, it was just a rip-off. Also pricey are the drinks. Cocktails hover at the £15 mark. I went to Nobu more out of curiosity than out of any great desire to try the food. Now that I’ve been, it’s confirmed my worse suspicions, which is that it’s more about the ‘scene’ and less about the ‘food’. Why Nobu ever made it into the San Pellegrino 50 Best Restaurants in 2009 was always a mystery to me. I’m just pleased that it’s not there anymore. Price range: About £40 – £60 a head. Excludes drinks and service. Love a scathing post! I have always resisted visiting Nobu as well on the basis its reputation is more about the name and the celebs who go there. Your review has only confirmed my preconceptions. What a moleface! That would have been funny to see both of you having a massive stare off! WELL? I hate stuffy places like that. Won’t be requesting that for my last meal! I definitely satisifed my curiousity. It was exactly as I expected it to be – very showy. Yes it was very stuffy. I should have practiced my stare off, but no point now as I’m unlikely to go again.